Secure, hold, and lock out electrical power handles and gate valves with cable lockouts from Seton. Easy-to-use and multi-purpose, our devices provide convenient energy isolation solutions. Seton's cable lockouts enable effortless cable cinching, especially for unusual tools. Our products can hold cables to keep valves and handles in the OFF position, effectively isolating energy sources. 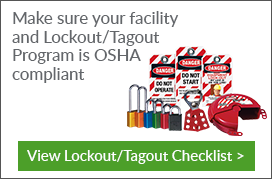 Our cable lockouts are available as individual products or as lockout tagout (LOTO) kit parts. Our devices can effectively restrict multiple energy sources individually, or with the use of other essential LOTO equipment. Great to have a replacement cable on hand when you need it. Cable lockouts are essential for holding energy-isolation devices in the safe or OFF position. These products provide protection against machines and equipment that suddenly become energized. Seton provides easy-to-use and multi-purpose cable lockouts which restrict electrical power handles and gate valves. Our cable lockout line includes cables, devices, and accessories that can withstand damage from chemical exposure, extreme temperatures, and corrosion. Designed to protect workers from possible electrical work hazards, our devices and accessories secure and hold cables in place with a simple squeeze of the handles and insertion of the cables in the locks.